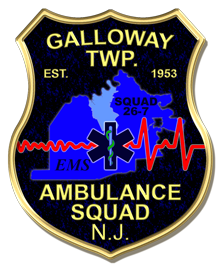 Galloway Township Ambulance Squad is a professional ambulance service which serves the citizens and visitors of Galloway Township and surrounding communities. 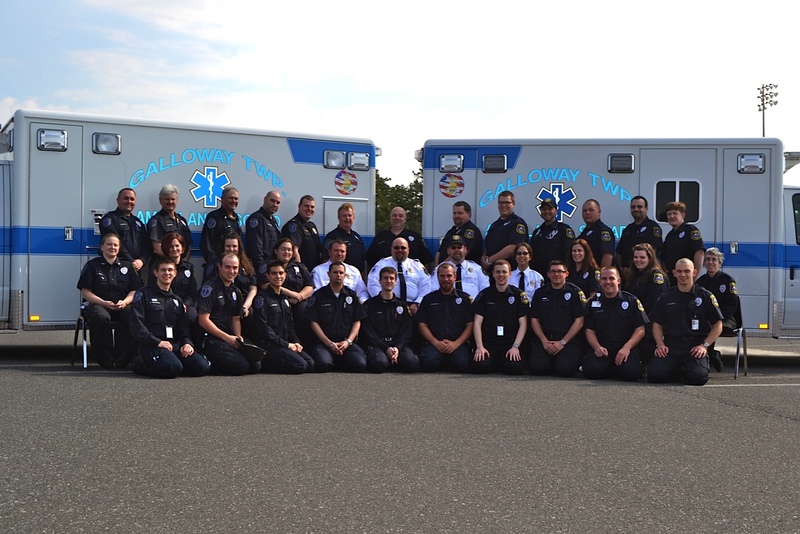 GTAS is the primary EMS provider for Galloway Township, Port Republic and the Richard Stockton College of New Jersey and will frequently provide mutual aid to Absecon, Egg Harbor Township, Hamilton Township and respond to calls on the Garden State Parkway. GTAS responds to more than 4000 calls for service annually and employs over 40 full-time and part-time Emergency Medical Technicians who are scheduled around the clock to respond to emergency calls. The staff of GTAS takes training and accountability very seriously with Cooper University Hospital providing medical direction and oversight. Cooper provides numerous services to GTAS including providing doctors available by phone 24 hours a day for consultation with EMTs during patient care, providing Paramedics and an advanced simulated human dummy for practical skills assessment during yearly skills assessments and assessing new-hires, conducting training classes with GTAS that allows ambulances to carry Epi-Pens for responding to severe allergic reactions and hosting GTAS staff in their ER for clinical experience and training. GTAS further continues education with quarterly all-staff meetings and daily quality assurance reviews over reporting. With an area of 114.8 square miles, Galloway Township is one of the largest in New Jersey. Galloway has more than 10,000 households and a total population of over 31,000 which presents several challenges for GTAS. GTAS has a comparatively large fleet of two command vehicles, five ambulances and one rehab unit. All GTAS ambulances are type III with full boxes where patient care is administered. All GTAS patient compartment areas are identical to promote familiarity and uniformity for our staff so that once an EMT is knows their way around one ambulance, they know their way around them all. Each ambulance is equipped beyond the state required standards so that even in the event a GTAS ambulance is responding to calls back-to-back without restocking, you can be assured GTAS will show up with the tools and supplies needed to effectively carry out patient care. Each GTAS ambulance is staffed by two Emergency Medical Technicians and take calls from two stations. 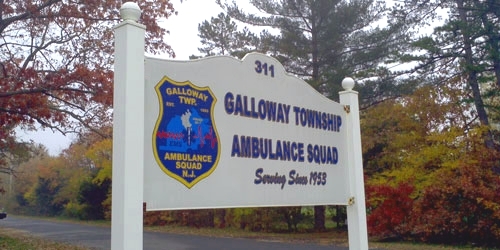 Such a large area of responsibility and a population of this size requires two stations, one on either side of town, in order to effectively provide fast EMS service to the residents of Galloway Township. 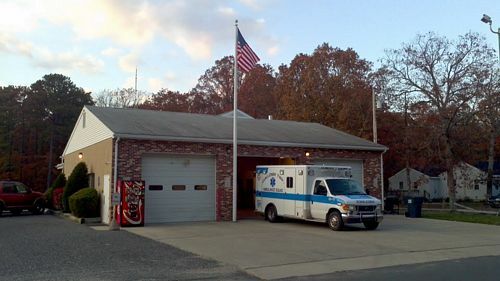 Station one is located on Carton Avenue on the west side of town next to Galloway Township Public Works just off of Route 30. 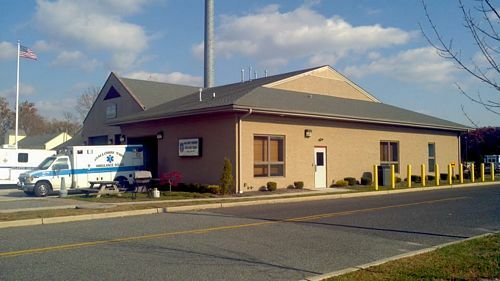 Station two is located in the east on the grounds of the Galloway Township Municipal complex on Jimmie Leeds Road. Having two stations is integral in such a large township. It allows GTAS to keep response times lower which translates to patient care being administered faster and thusly comprehensive care being initiated faster. GTAS staffs both stations during the day, with a crew at each, and one during the late hours of the night responding from station two. Call volume does not warrant two crews being available late at night so GTAS responds from station two due to the majority of calls coming from that side during the night. Though GTAS makes every effort for an ambulance to be ready when a call comes in, at times GTAS receives a call for service while all crews are currently busy with other incidents. 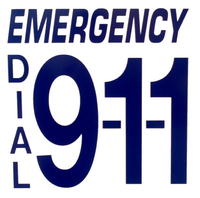 GTAS employs an "all-call" system through members with pagers that are activated when no duty crew ambulances are available. 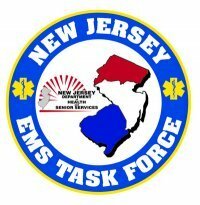 Members will call in to dispatch and respond from home when necessary at all hours of the day and night. In the event no off-duty EMTs are available, GTAS participates in mutual aid with surrounding towns and municipalities where EMS services are shared during times of high volume or large incidents requiring more resources than any one agency can provide. GTAS is proud to serve the citizens and visitors of Galloway Township and has done so for more than 50 years. In January of 1953, the Galloway Township American Legion Post #430 resolved to organize an ambulance service for Galloway Township residents and the neighboring communities. In August of that same year, the American Legion Post purchased their first ambulance; a Chevrolet at a cost of $4,407.25. On September 1st, Galloway Township American Legion Post proudly placed their first ambulance into service. By the end of that year, the new ambulance and their dedicated volunteers had made 47 trips to medical facilities carrying 53 patients. 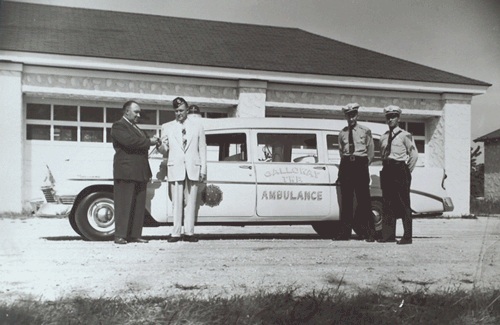 In 1960, the American Legion Post purchased their second ambulance; a Cadillac. As the population of Galloway Township grew, so did the calls for emergency medical services. In 1974, the Galloway Township Ambulance Squad responded to 770 calls and now was operating four ambulances out of two stations. In 1996, with the exploding population and the increase demand for emergency medical services, the ambulance squad members, along with elected and appointed Galloway Township officials, started planning for the future. The goal was to develop a plan that would ensure that all Galloway Township residents and visitors would continue to receive professional emergency medical services. 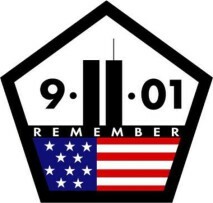 On July 1st 1999, the Galloway Township Ambulance Squad evolved into its current non-profit corporation. "To provide superior pre-hospital medical care and transportation to the residents and visitors of Galloway Township and surrounding communities."